“We have not observed any element that can disqualify the electoral process,” said Ceela President Nicanor Moscoso. May 21 (teleSUR) Representatives of the Council of Electoral Experts of Latin America (Ceela)stated that the results of Venezuelan elections on May 20 must be recognized because they represent the popular will expressed by the people. Speaking during a press conference, alongside Delcy Rodriguez, president of the National Constituent Assembly (ANC), the international commission, which was deployed to Venezuela to monitor the electoral process, assured that the decision made by some countries to ignore the results is politically motivated. The organization, which routinely carries out as accredited international chaplains for the presidential and legislative elections in the Americas, highlighted that Venezuela is the only country that audits their voting procedures. While many countries in Latin America and elsewhere have recognized the Venezuelan elections and congratulated President Nicolas Maduro, such as Cuba, Bolivia, El Salvador, Nicaragua, Iran, Russia and China, right-wing governments have dismissed the vote as “illegitimate,” echoing statements by the United States, Canada and other Western countries who had dismissed the electoral process and the results even before it took place. The so-called Lima Group – Peru, Argentina, Brazil, Mexico, Panama, Paraguay, Santa Lucia, Colombia, Honduras, Costa Rica and Guatemala – plus Canada,issued a statement Monday saying it did not recognize the legitimacy of Venezuela’s presidential election. It noted that their respective countries will recall their ambassadors from Caracas for consultations and hold a meeting to coordinate a regional response to what they call “crisis” in Venezuela. They also said they would seek a new resolution on “the situation” in the South American country. Meanwhile, the Iranian government issued a statement saying that Venezuela’s elections, “despite internal pressure and foreign threats and sanctions, is a great victory and an achievement for democracy in Venezuela. Meanwhile, Venezuela’s popular electoral process did more than just ruffle the U.S. feathers. Vice-president Mike Pence and Secretary of State Mike Pompeo said Sunday’s vote will result in rapid “economic and diplomatic” measures. “Venezuela’s election was a sham, neither free nor fair,” Pence noted in a statement, notwithstanding that his boss, U.S. President Donald Trump, who lost the popular vote, was installed by an elitist, minority electoral college. “The United States will not sit idly by as Venezuela crumbles and the misery of their brave people continues…The Maduro regime must allow humanitarian aid into Venezuela and must allow its people to be heard,” he said, according to Reuters. 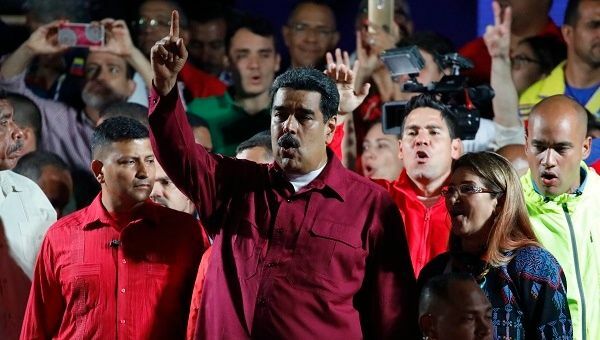 The latest report issued by Venezuela’s National Electoral Council (CNE) indicated that incumbent President Nicolas Maduro had exceeded six million votes in yesterday’s election, increasing his winning margin from the 5.8 million votes announced Sunday night by the CNE. Sandra Oblitas, vice-president of the CNE, informed that Maduro received 6,190,612 votes, while his closest opponent, former governor Henri Falcon, obtained 1,917,036 votes.